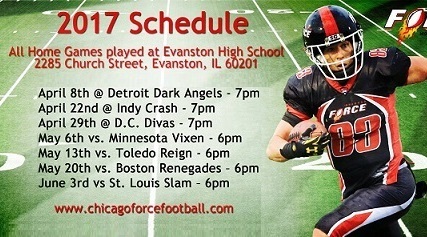 The 2017 season starts April 8th against the Detroit Dark Angels. Our next match up is April 22nd versus midwest rivals the Indy Crash. Then we head out to the east coast to challenge the two-time defending WFA champion D.C. Divas on April 29th. May 6th is our HOME opener and brings us back to our former stadium Lazier Field, at Evanston Township High School, a crowd favorite and our home field during our perfect 2013 Championship season. 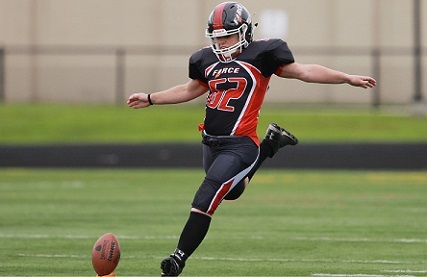 The Minnesota Vixen, new to the WFA, come to town for that contest. The Toledo Reign makes their first appearance against the FORCE on May 13th. May 20th ushers in our favorite rival, the Boston Renegades. Every game with Boston promises to keep you on the edge of your seat. We close out the season with the hard-hitting St. Louis Slam on June 3rd, before heading into PLAYOFF season!